I would like to inform you abput my attempt to get in contact with BP plc about teh oil spill in Mexico. Years ago I in contact with US Commerce made up my Business Outline and registrated my company OCO International Inc., USA in Texas. The basis for my Busines Plan was my patents on the "Boprod" - Blow Out Production System. Unfortunately for business, I had to go back to Norway for other imperative matter. My H2 Visa expired and I have not obtained a Green Card allowing me to work in the USA. To owercome this problem I may work as a consultant to OCO International Inc., USA through OCO International Norge. As I have not yet heard back from BP in the USA, I would kindly ask you to help me with contact information to BP Mr. Doug Sutters, whom I understand is in charge of the operation. I wrote the above in 1998. Now it happenes again? Please find enclosed a picture from the initial model test, concept presentation. If you want to learn more how this "blow out" was controlled, just come back to me. P.S. I would appreciated your confirmation of receiving this e-mail, so I know it has been brought to your attention. NORWAY AND FOLLOW UP WITH THEIR HOUSTON OFFICE. Newsweek, Lloyds List and a number of Norwegian press had notices about "Boprod" when presented on pressconference in Bodö in January 1981. 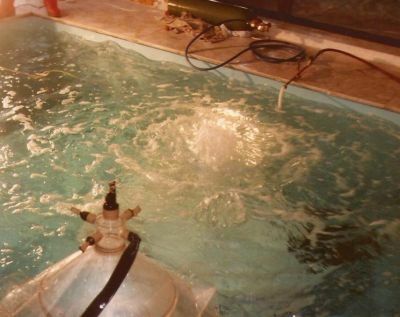 Not all of them to the point, but the principle of the "Boprod" concept were laid down as the most promissing concept for controling subsea blowouts. I have recently made an approach to selected US media about "Boprod", waiting for them to come back to me. May I ask you to forward me the e-mail address, or direct contact information to Mr Doug Sutters in BP, who I understand is in charge of BP's operations? Thank you, but we are not part of the response team. BP is trying out several methods right now as you may read about. I have never heard about Boprod, but hope you succeed with your effort. Jeg hadde i dag en hyggelig samtale med Ole T. Bjornevik på hans kontor. Han forslo at jeg kontaktet deg direkte i Houston. Etter hva jeg mener har vi truffet hverandre tidligere i Aker-sammenheng, eller i annen forbindelse? Konkret er det nå 2 uker siden jeg tilbød min assistanse til BP i USA i forbindelse med oljeutblåsningen i Mexicogulfen? Etter den forrige store utblåsningen, IXTOC I, utviklet jeg "Boprod" konseptet for nettopp kontroll og produksjon av olje fra utblåsninger. Modellforsøk for å illustrere konseptets prinsippielle virkemåte ble gjennomført på privat basis med film og bilder. Konseptet oppnådde prinsipp-patent i en rekke land herunder Storbritania, USA, Canada, Mexico, Norge med flere, og opphavspersonen til prinsippet kan verifieres tilbake til 2.11.1979. Konseptet "Boprod" kan gis ulik utforming i praksis, men selve prinsippet er jeg overbevist vil bidra til å avhjelpe dagens situasjonen, spesielt nå som vi har fått verifisert at "trakten" ikke fungerte. Kom gjerne tilbake til meg. Felles målsetning må være å gjøre det beste ut av en vanskelig situasjon for alle berørte parter. Years ago in 1987 I registrated a company OCO International Inc., USA in Texas for the purpose of promoting my patented "Boprod" system on a world wide basis. The basis for my invention, patent application in Norway of Nov 2nd 1979, was the "IXTOC I" blow out in the Gulf of Mexico. Since then the blowout control part of the invention obtained patents in several countries outside Norway including U.S.
My business plan included offering service to the oil industry placing "Boprod" units on standby in critical environmental areas as Gulf of Mexico, outside California, Alaska, North Norway and so on, making it possible to get the oil spill from a blowing well or leakage from subsea installations under control while other means for repair, actions, were taken including drilling of relief wells. The business idea as such was to charge a standby rate from the operators signed up for this additional "insurance" in the actual geopgraphical area, and then charge a 50% interest in the value of the recovered oil after covering operational expenses when put into operation. As such I was looking for partner /investor to join in on the ownership and running of the company. I do not see any reason to change this business philosophy, as the need for such a system on standby is again documented. However, BP's present situation requires immediate action and any means to collect as much as possible of the streaming oil would be a profit situation for all parties involved. My first thought was to offer my knowledge and competence to BP on a consultancy basis. As I did not get the early respons looking for from BP, I have placed some inquiries to others in the Gulf area for cooperation/partnership. Hopefully I will have some response later on today, and may inform BP accordingly. Jeg hørte ikke noe fra Halliburton i går. Avventer de signalene du får tilbake fra BP i USA. Ellers var jeg var redd for at vi skulle få en Blow Out på norsk sokkel før valget i fjor 2009, men i stedet fikk Norge "Full City" - "menneskelige feilvurderinger" det også. Shells Resident Engineer Mr. Pete Groendijk som ledet byggingen av Condeep "Brent B" i Stavanger 1973-75 uttrykte under et møte engang: "This is either incompetence or sabotage". De ordene brente seg fast i mitt hode, og jeg har stor respekt for den livserfaring han måtte ha hatt med seg fra sine engasjementer for Shell rundt om i verden. Ikke å undre at han som pensjonert Shell medarbeider (55 år) ble tilkalt for Brent B prosjektet som dengang var pioneervirksomhet. Ad det som skjedde på norsk sokkel for 30 år siden velger jeg å vise til: Letter dated January 28th, 1991 from Legal Attache R. John Theriault, Jr. at the USA Embassy in London. Når det gjelder hendelsen i Mexicogulfen skulle det vel ikke være tvil om at det ligger under FBI's jurisdiksjon. Hva med BP plc - er det fremdeles å regne som et Britisk selskap og hva med Scotland Yard i den forbindelse? To: Halliburton "Products and Services"
The "Boprod" system application for control of blowing oil wells subsea could help out on "Deepwater Horizon" accident in Gulf of Mexico. Your request has been sent to the appropriate person in our organization and they will respond to your request shortly. This for your and BP's information. If this works out with BP's thinking, and the appropriate person within Halliburton gets back to me, I am ready to act on short notice. My cellar phone is +47 45006143. Before that I served as Technical Division Manager of Aker Offshore Contracting AS responsible for Engineering & Quality Control also AOCLtd. Aberdeen during Brent Delta offshore hook up. I started out my career within Aker developing the Condeep Platform ballast and oil storage system - ending up as Project Manager for Akers part in the construction of "Brent Bravo" put in place 1975. As representative for Aker within Brownaker, I had some strong discussions with officials within Brown & Root at that time, and later during my occupancy as consultant for the Norwegian Cost Analysis Committee. When registrating my Company OCO International Inc., USA in Texas 1987 I declined an offer to cooperate with Brown & Root. My doing so was based on lack of knowledge about Brown & Root and Halliburtons involvment in the "Sabotage of Alexander L. Kielland" in March 1980. I have later come to the conclussion that the company Brown & Root was not involved in the sabotage itself but in the cover up. All companies are subject to infiltration by unthrustworthy individuals and criminals. Many companies and people were caught in the cover up of "Kielland" on the wrong basis. As such with my present knowledge, I can defend to myself placing an inquiry to Halliburton for cooperation. Then it whitstands to learn if the officials of Halliburton in an emergy situation, as yourselves, can overcome previous disagreements? If I do not hear back from Halliburton in a reasonable time, I am prepared to work with BP in the best interest of both parties. I do not intend to use past president George W. Bush as reference as I have not asked him, but we met in 1995 when he served as Governor of Texas. I trust he and everyone else along the South Coast of USA wants this environmental and ecconomical threat to be overcome as soon as possible. Thank you for your interest in Halliburton. Your request for information relating to Halliburton Products and Services has been directed to an expert and you will receive a response shortly. Please do not reply to this email, it is an automated notification, which is unable to receive replies. If you are a job seeker, we welcome your interest in a career with Halliburton, but we cannot process requests through this section of the site and no further action will be taken. You must use the relevant Careers Contacts forms in the Careers section. You can also view and apply for available jobs on the site. BP John Barnes av 25. april. Jeg fant et tlf nr.på nettsiden som jeg ringte, antar det var til informasjonsavdelingen? I og med at jeg ikke fikk bekreftelse på at mailen er mottatt, og ikke har hørt noe tilbake fra andre i BP, ringte jeg på nytt, men kom ikke frem. Derfor denne henvendelse til BP Norge. I og med vi her står overfor en konkret situasjon er det tiltak, ad hock løsninger, som kan "spesialsys" rettet mot dette tilfelle. En beredskapsløsning ville legge noen andre føringer for tekniske utforming av et stanby konsept, men jeg ser liten hensikt i det i denne forbindelse. Her gjelder det å finne en praktisk løsning for å begrense utslippet raskest mulig mens avlastningsbrønn bores. Jeg tilbyr å bistå BP på konsulentbasis om det er ønskelig. OCO International Inc.,USA i Texas med bl.a. dette i tankene. > Sorry, I am out of the area and not directly involved with the response, with no access to that information. > Thanks, but I was through that round last year, and then for some unknown reason my communication with US Coast Guard stopped on a higher level? > If not we might have had the plans ready to go at this time. > Nevermind in a critical situation there are possibilities for shortcuts. > I am trying to get in touch with BP whom I understand is the operator of the leaking well. > Do you have any mail address to BP operational center for the crises? > "This application of the "Boprod" - Blow Out Production System is a system for getting uncontrolled subsea oil and gas streams under control in such a way that the oil and gas can be commercially utilised during the period of time other means of seeking control are being applied, as for instance drilling of relief well(s). > Having an uncontrolled subsea well blowing for some time will cause pollution of the sea and the surroundings demanding large amounts of money having to be spent in order to limit such effects and/or to clean up afterwards. > The main objective is to limit the risk related to oil and gas exploration activities at sea, limit the cost involved with an uncontrolled blowout at the sea floor, and recovery of a major part of the produced oil. The "IXTOC I" blowout which occurred summer 1979 in the Gulf of Mexico kept on "blowing" 20.000 bbls per day in 6 months before it was killed. The direct loss in production value was approximately 100 mill $ at that time in addition to killing and clean up charges.Even an oilprize of 15$ per bbl would make a loss in production of 50 mill. $ which by itself should justify investment in this type of equipment. In addition savings on clean up and other related cost including reduced insurance premiums. > I wrote the above in 1998. Now it happenes again? > Please find enclosed a picture from the initial model test, concept presentation. > If you want to learn more how this "blow out" was controlled, just come back to me. > P.S. I would appreciated your confirmation of receiving this e-mail, so I know it has been brought to your attention. >> Thank you for your interest in helping respond to the efforts in the Gulf. >> links that help companies who have not done business with the USCG or the U.S. government before. >> Thank you for your inquiry. >> being applied, as for instance drilling of relief well(s). Bjørge Stensbøl was in many years head of Norways Olympic Training Team with good connections to top playors within Norwegian and International Olympic Committee, among them Gerhard Heiberg. Go to section: "PRIOR TO Deepwater Horizon."